All the students studying in HP University B.Tech I, III, V or VII Sem are advised to download their exam time table published on the official website of the university www.hpuniv.nic.in. Datesheet for B.Tech. 1st, 3rd, 5th and 7th Semester Regular for UIIT and Supplementary examinations for late College students of other Private Engineering Colleges to be held in December, 2013. HP University Himachal Pradesh published the Time table for December 2013 Examination for odd semesters which is available to download from www.hpuniv.nic.in or click on the following direct link. 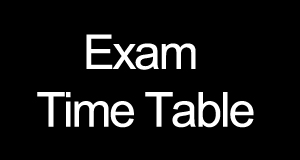 Click below for HP University B.Tech Time Table Download, containing the exam schedule to be held in Dec 2013, examination centers details, Time of Examination etc.